PAUL JAY, SENIOR EDITOR, TRNN: Welcome back to The Real News Network. I’m Paul Jay, coming to you today from Beirut. And if you watched the first segment, you met Muntadhar al-Zaidi. He was the man who threw the shoe at President Bush. And we’ll show it to you one more time because most people around the world find this rather pleasing to watch. [clip plays] Now back again with Muntadhar al-Zaidi. Thanks for joining us again. 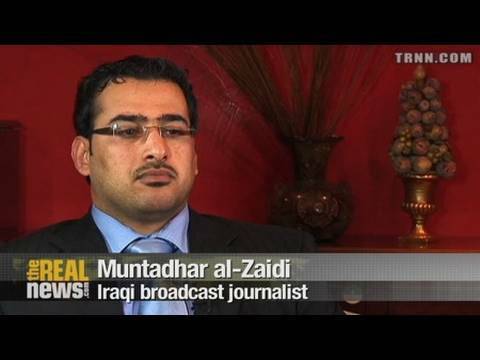 MUNTADHAR AL-ZAIDI, IRAQI BROADCAST JOURNALIST (SUBTITLED TRANSLATION): Welcome. JAY: So before the incident with Bush and the shoe, what were you working on as a journalist? What kind of stories? without being able to fight them back. And when Iraqis resist, America paints them with the same brush of terrorism. JAY: What happened to you after you threw the shoe? What came next? AL-ZAIDI: There were stories I used to hear about, but that day I saw with my own eyes. While in the hall, they broke my teeth, the front two. Later I got them repaired. And I couldn’t see with one eye, and bruises on my face from the beatings. They broke my leg. AL-ZAIDI: Iraqi security men. And certainly there were American security with them, but I was blindfolded, so I couldn’t see. Also, my back has lacerations. They used electricity on me; they submerged me in water; they tortured me with thick electric cables. It went on all night until morning. The event lasted two days. And on the third, they transferred me to another place and continued to beat me until morning. And there are still marks of the cable beatings on my feet, back, and arms. My entire body was the color purple from the beatings. My body was first blue, then after more beatings my skin turned black, then dark mauve. I stayed like this for three days, with my face entirely swollen. They put me in solitary confinement for three months, with no one permitted to see me, and I wasnï¿½t allowed to see anyone, to speak to anyone. A guard was bringing me meals through a small opening in the lower part of the door, and he escorted me to the toilettes three times a day. Even my name was stripped from me. It was no longer Muntadhar. I was not allowed to use my name. When the soldiers called upon me they used "Number Eight". Even for meals, the guard would say, "Number Eight, pick up your food." "Number Eight, prepare yourself to go to the toilette," three times a day. And for the rest of the time, they emptied bottles for me to urinate in and take them with me to the toilet. Then the trial began. JAY: So if I understand correctly, they held you, before court, for three months. You went to court, and they sentenced you for three years. But they let you out after six more months in jail. The next six months, did they continue to torture you this way? AL-ZAIDI: No, they did not torture me during the six months. They only tortured me in the first few days. But when the media pressure was mounting on them, and when my brother managed to come and see me and saw my conditions, he published the news of the torture. However, the judge asked my brother not to say I was being tortured. The judge was siding with the government. Now both the government and the law were against me. When my brother exposed them with the news of torture they stopped the torture, but the more severe torture was keeping me in a solitary cell for three months. After my face got better and the marks and signs of torture were gone, they made me appear in court. While in jail, even when I was going to the toilette, they covered my head with a bag so that none of the soldiers would see and expose that Muntadhar al-Zaidi is being tortured or his face has signs of torture. After the solitary confinement, where they tortured me in this cell for one whole day, then I was taken to court. After the court issued the jail sentence, they transferred me to another prison, a bit bigger, where I stayed for six months. The total period I stayed is nine months, so they reduced the sentence. We have an Iraqi law that stipulates if an inmate spends three-quarters of his sentence in good behavior, he can be released. Of course, I am not mischievous. I threw the shoe because I’m a patriot. JAY: In the next segment of the interview, let’s talk about what happened when you got out and what you think of the current situation in Iraq. So please join us for the next segment of our interview with Muntadhar al-Zaidi on The Real News.